Simon Business School welcomed its seventh dean, Andrew Ainslie, this past summer. 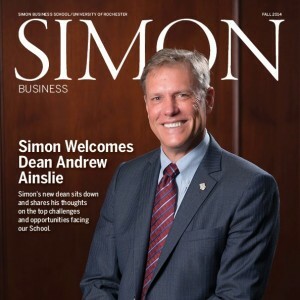 The writers of Simon Business Magazine sat down with Dean Ainslie for a Q&A, which was featured in the magazine’s most recent issue. The article is a great insider’s look at what attracted the Dean to Simon and what he envisions for the school’s future. Beyond Simon, he addresses the business education industry at large and his strategy for keeping up with its ever-changing landscape. The Dean also discusses his professional experience running the MBA program at UCLA Anderson. Click here to access the full Q&A article to learn more about Dean Ainslie! Lucky to Meet People from All Over the World!